Thank You, Less Is More! This week is "lucky dip" week at Less is More. Near as I can tell it has something to do with the fact that there are five Saturdays in April instead of four, kinda like a wild card or anything goes day. Anyway, Chrissie and Mandi have decided for the "lucky dip" they wanted to thank all the faithful LIMettes for playing along each week. So... our challenge is to make a "thank you" or "congratulations" card. 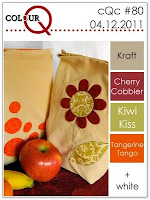 Once, again, I'm using the color combo from ColourQ for my card. I made a card like this earlier this year and decided to remake it using more colors (the first card was made using only grey ink and white cardstock). I also moved the position of the main panel. Stamps used are from the Stampin Up! sets: Vintage Vogue and Because I Care. Thanks for taking a peek.... and thanks Chrissie and Mandi for providing such great challenges week after week!! My card that is... 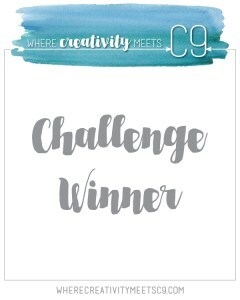 The challenge this week at Stampin' Sisters in Christ is to make a round card and when I saw Silke's sketch challenge over at Flourishes I knew I would be combining the two. 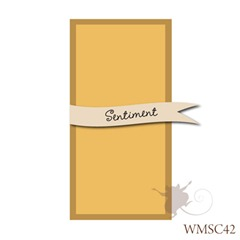 I always love how the gals at Stampin Sisters in Christ connect their devotionals to cardmaking. This week was no exception with Rebekkah providing a wonderful devotional about the sacrifices Jesus made for us, the promises that Easter brings and our need to remain strong in our faith. For my card I used the pansy image from the Flourishes set A Year of Flowers 1 and a sentiment from the Lenten Rose set for the card. My color inspiration came from a lovely 6x6 pad of papers from SEI called Couture. I colored the image with the following Copics: V01, V12, V15, V17, YG93, YG95, YG97, Y02 & Y06. The round card was made using the largest die from the Spellbinders Lacey Circles dies. The sentiment was diecut using the 2nd smallest die from that set. Thanks for taking a peek... hope to be back later with my card for Less is More! Another clean and simple card today. The last few days I have not felt very creative and when that happens I tend to go with what works for me best... clean and simply. Oh... I just LOVE white space! For this card I used the color combo from CR84FN of Aqua, Red and White. I almost passed this combo up, but in the end I just couldn't resist using it for my card. However, I am getting my card in with just a few hours to spare! 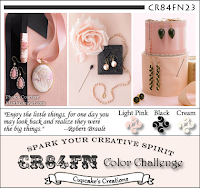 I'm also going to put this into the challenge over at Claudia & Company since it is a CAS challenge and I'm not one to pass up anything that has to do with CAS. I used the really fun Hero Arts cling set My Type. I stamped the typewriter using SU! 's Taken With Teal and trimmed it out. The sentiment was stamped with PTI's Pure Poppy. Some Pure Poppy buttons were sewn to the typewrite, as well. I tied Pure Poppy double stitched ribbon (I think my most favorite ribbon to tie) around the white card piece and then the typewrited was adhered using adhesive foam squares. The entire piece was then adhere to the card base. I stamped all the butterflies on vellum using Versamark watermark ink, embossed them using Filigree white embossing powder and trimmed them out. I stamped the turquoise card base with the Hero Arts cling Classic Fabric Design using Versamark as well. I stamped the label using Palette Cote Azure ink (which sadly seems to be going dry) and trimmed it out. 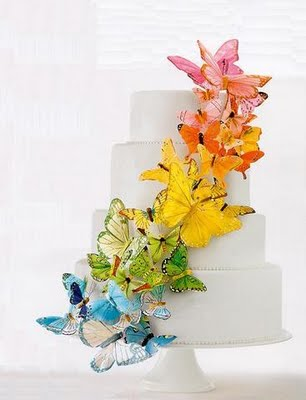 The label was adhered and then all the butterflies were applied to the card. ODBDSLC58 - A Sketch and Some Exciting News! My card today is for the current ODBD Shining the Light Challenge #58, a sketch challenge. I'm also going to share some exciting news... For the months of May and June I'm going to be a Guest Designer for the ODBD Shining the Light challenge!!!! I cannot tell you how excited I was when I got the email from Chris, the challenge team coordinator, asking me if I wanted to be a guest designer! And, of course, I said "YES!!" 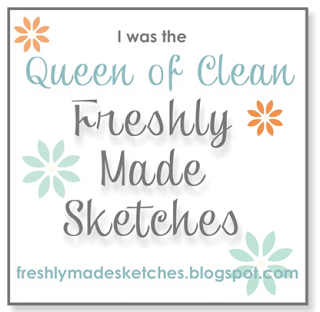 From the very start of my online papercrafting journey Our Daily Bread Design stamps have been a favorite of mine. I love everything about them from the images to the scriptures and sentiments. I cannot tell you what a blessing it is to have stamps that help me express and share my faith! For my card I used two ODBD sets "Sing to the Lord" and "Tulip Tag". The color combo comes from the current color challenge over at Splitcoaststampers of Bashful Blue, Baja Breeze and Certain Celery. I followed the sketch pretty faithfully except that I did not add the extra rectangle with the oval because I didn't want to cover up the little bird image from the "Sing to the Lord" set. 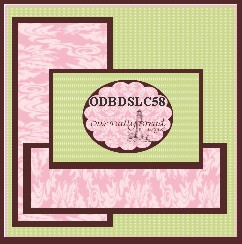 I diecut the oval using the ODBD/Spellbinder exclusive die set called Elegant Ovals (love those dies!!!). A bit of distressing was done to the card using a distressing tool and Rangers Old Paper Distress Ink. Thanks for taking a peek.... and thank you to ODBD for giving me the opportunity to be a guest designer! since I participate in a DeNami Design challenge. So I took a look a what their current challenge was and when I saw it was a color challenge I decided to take the plunge because I just can't pass up a good color challenge, ya know??? 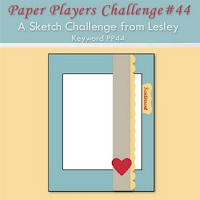 The Paper Players have a lovely sketch for their weekly challenge and so I decided to pair that up with the DeNami challenge. At first I was going to use my most favorite DeNami stamp a beautiful lilac image. But after I stamped it on the cardstock I discovered that a good portion of the image would be covered up by other elements in the sketch and it just didn't look right. So, I settled on another DeNami stamp, Large Flower Spray, for the card. The challenge this week at Less is More is to stamp or place your image off center. Now if you have spent anytime looking at my blog you will notice that I tend to place images off center, especially when it comes to CAS cards. So... this challenge is right up my alley! 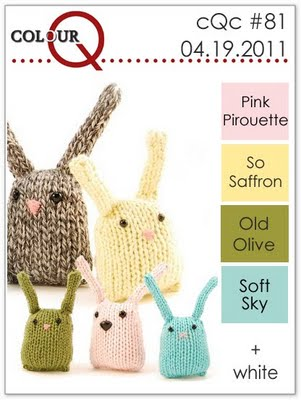 I decided to combine the Less is More challenge with ColourQ, (aren't those little bunnies in the inspiration photo just too cute??!!!) again, this week and made a Mother's Day card that I will be giving to my mom. 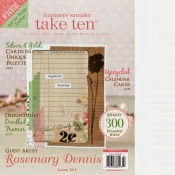 Stamps are from WPlus9 Designs Woodgrain Silhouettes and Woodgrain Silhouettes Additions. Thanks for taking a peek... If you haven't checked out Less is More yet, you really should! Amazing inspiration from Lady LIM Chrissie, Diva LIM Mandi and all the LIMettes! Posting a card for two challenges, JustRite Stampers Friday Challenge to make your own flower embellishments and Flourishes to use aqua, brown and yellow. For the Flourishes challenge I decided to go with a more blue aqua color instead of a green aqua color. I stamped the image from the JustRite set Breath of Spring in Memento Rich Cocoa and then colored it with Copic markers (BG000, BG01, BG02, YG00, YG03). The image was then diecut using a Spellbinders Plain Oval die. Dark Chocolate cardstock was diecut using a Spellbinders Scalloped Oval die and the two were layered together. I used my new Spellbinders Labels 21 dies to cut the Lemon Tart cardstock. Some PTI Spring Rain Bitty Dot Basics paper was cut to fit the card base and distressed with Old Paper ink and a distressing tool. I made the flowers using cream felt, the Spring Rain pattern paper and PTI Lemon Tart buttons. The felt and paper were cut using dies from my Heartfelt Creations/Spellbinders Posy Patch dies. The Dark Chocolate cardstock looks black, but it is dark brown. *Edited to add: "Well... OOOPS!! I totally missed that my one layer card was supposed to be a "thank you card"! Oh well..."
That make life better! 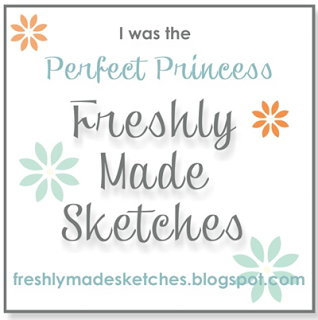 And that happens to be the sentiment I used on my card for One Layer Wednesday. The challenge Susan set us this week is the opposite of Jennifer's challenge from last week. 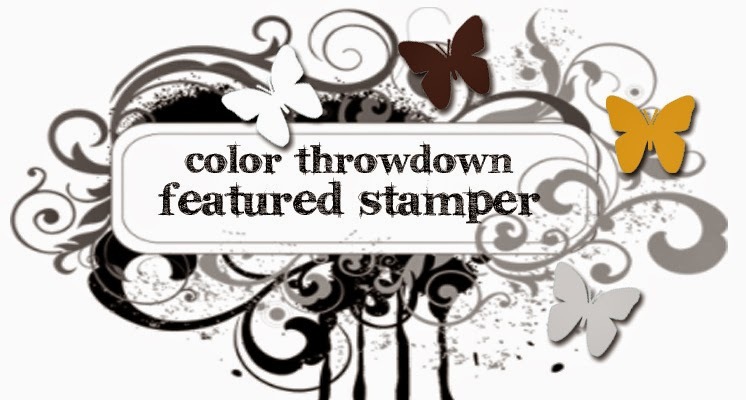 Last week Jennifer challenged us to use a new stamp that had never seen ink. So this week Susan challenged us to use a stamp we have had for a while, but have not inked up in recent history. I have lots of stamps that fall into that category (shocking, I know!). After some thought I decided to use my Stampin Up! set "Happy Harmony" because it is one of my favorite SU! sets. And since I'm slightly obsessed with the current Splitcoaststampers color challenge combo of Crumb Cake, purple and ivory I made another card using those colors. I don't know about you, but I have way too many stamp sets that I have bought, but have never used. One of those sets was PTI's "Just the Ticket". I can now say that after owning the set for longer than I care to remember it has finally seen ink! And it is all thanks to the lovely sketch provided by the super talented Jaydee from the Paper Players. When I saw her sketch this past weekend I kicked around a few ideas and then settled on using "Just the Ticket" and the matching die (which I had never used either!!). I diecut three sets of "tickets" using SU! 's Crumb Cake and PTI's Vintage Cream & Plum Pudding. The images were stamped on the Vintage Cream strip using Plum Pudding ink. The Crumb Cake & Plum Pudding strips were used as mats. I inked up all strips with some Old Paper Distress ink, as well as the edges of the Vintage Cream card base. Finished things with a some purple and brown bakers twine. 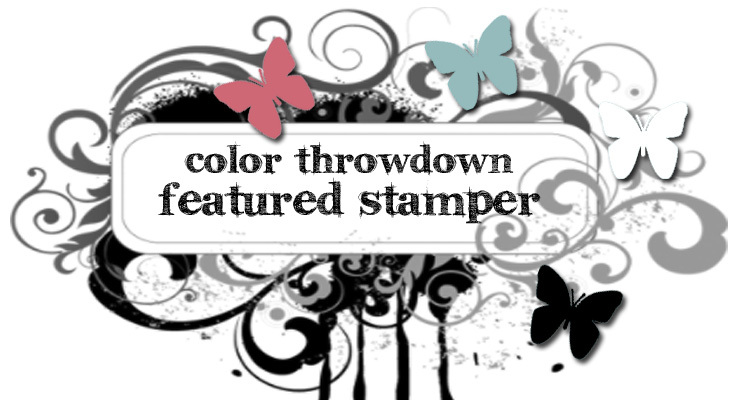 The color combo comes from this week's color challenge over at Splitcoaststampers. A quick post with a card for ODBDSLC#57 no coloring on your card and CR84FN to use aqua, light blue and cream. 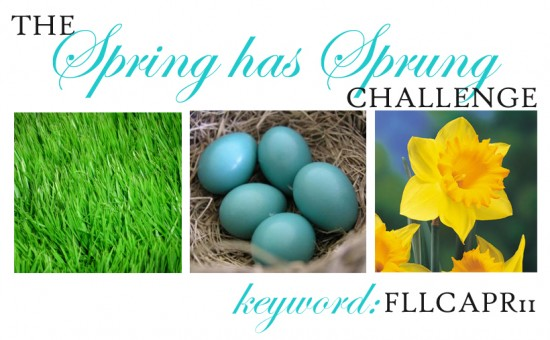 Since I trying to get a few Easter cards done before Easter arrives I have been using some of the challenges I participate in to help me along. Once again I absolutely love the color combo from CR84FN, but got a little stumped when it came time to put my card together. I first went in one direction, but didn't like what I came up with and so scrapped that card. I decided to use a favorite sketch from Clean & Simple and keep things CAS. All stamps are from ODBD (Faith & Daffodil Tag sets). Quick post with my carde for One Layer Wednesday. The challenge set by Jennifer this week was to use the colors pink and green and stamps that had never, ever seen ink. Sadly the never, ever seen ink portion of the challenge was all too easy to fulfill!! For my card I used the Flourishes set Clematis & Butterflies and Stampin Up! inks Pretty in Pink and Pear Pizzazz. I must admit that when I saw Chrissie & Mandi's challenge over at Less is More I was a little stumped as to what I would do. I don't often use acetate as I haven't had very good experiences with it. I have tried making cards with little success and I have bought acetate shapes only to realize later on I just don't know what to do with them. But... I so enjoy the Less is More challenges that I knew I would over come my hesitation and managed to come up with a card. 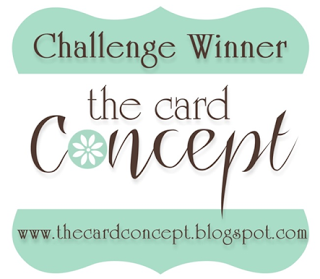 It helped that I had started working on an idea for a card for the current color challenge over at ColourQ. I dug around in my stash and came up with some acetate shapes that I had bought a few years ago. One was this bracket that I inked up with Staz-On White Cotton ink. The little dress form comes from one of my favorite small stamp sets from PaperTrey Ink, as does the sentiment. I was going to put the buttons on the card in a different spot, but thought they would look better grouped with the other items. Just Squeekin' In With This One.. Thanks for taking a peek... 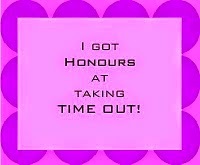 I'm going to take a bit of a rest now!! Well... at least on my card!! Here in the Pacific Northwest (Washington State to be exact) spring is trying really hard to arrive with flower popping out all over the place, but sunshine and warmer weather have yet to make an appearance! So... I guess I will have to be happy with making spring-like cards. My card today is for the Flourishes challenge "Spring Has Sprung" as well as the Penny Black Saturday challenge "Flowers". I used an image from the Penny Black set "Flowers & Wishes" for my card and colored it with Copic markers (B00, B02, B05, YG03, YG06, Y11 & Y13) to correspond with the color palette for the Flourishes challenge. For once I didn't use a white cardstock base, but used a retired SU! green called Gable Green. The other cardstock is from PaperTrey Ink (white, Lemon Tart & Spring Rain). Since I hadn't used ribbon on anything in a few days I just had to put some on this card! Thanks for taking a peek... hope spring has arrived in your neighborhood! This time from those lovely ladies over at The Paper Players. 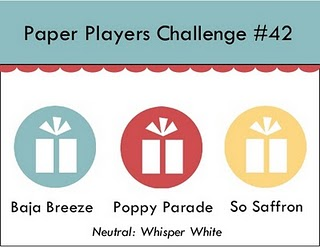 Their challenge this week is to use the following colors: Poppy Parade, Baja Breeze and So Saffron. 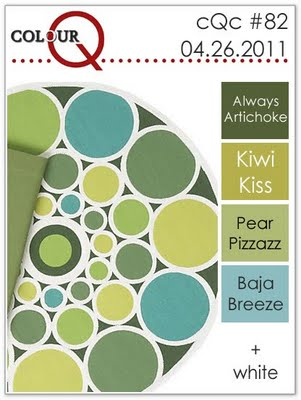 All pretty colors, but not necessarily ones that I would think to put together on a card. But if you take a look at the fabulous samples from the design team they obviously do work perfectly well together. After some careful consideration and hunting around for scraps of Poppy Parade & Baja Breeze I think I succeeded in creating a card with a nice balance of all the colors. 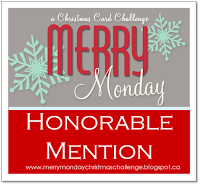 I'm also including my card in the current Our Daily Bread Shining the Light challenge to make a card that has NO RIBBON on it! Now initially I thought I would have a bit of a problem with that because well.... I LOVE RIBBON! But I am quite capable of leaving it off a card. 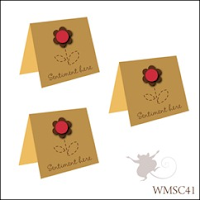 Stamps used on the card are SU! 's Fast & Fabulous and ODBD's Faith. Hello! Another one card, three challenges post! My card today is for the following challenge: Waltzingmouse, CR84FN and Shabby Tea Room. 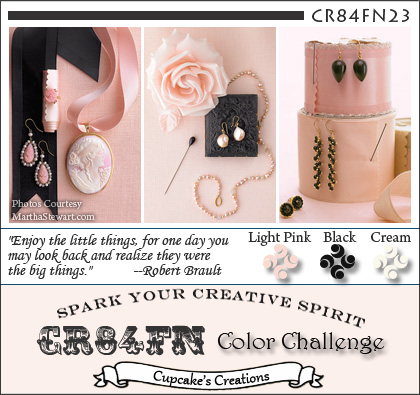 The colors for CR84FN this week are pink, black & cream which worked nicely with the inspiration idea from Shabby Tea Room of doilies & lace. The Waltzingmouse sketch is a perfect canvas for both challenges. 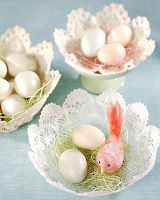 I just love the inspiration photos from both CR84FN and Shabby Tea Room. They are both so beautiful! I just couldn't resist trying to come up with a card! I used stamps from Waltzingmouse (Victorian Frippery & Frame It) and PaperTrey Ink (Turning a New Leaf) for the card. I was able to get the matching Turning a New Leaf dies and had been wanting to try them out so I used them on this card. I love "fussy" cutting, but boy oh boy having those dies sure makes it a snap to cut out those leaf shapes and then stamp them! I used the large rolled rose die from My Favorite Things to make the black felt rose. YEE HAW!! Its a Birthday Blog Hop! Happy, happy birthday Elise!! I hope you have the most wonderful day my friend because you totally deserve it. Below is the list (with links) of everyone participating in the hop. I hope you will take the time to do the hop and to wish Elise a happy birthday! The challenge today at Less is More is to put the focus on your sentiment. Many stamp sets and ideas raced through my head as I thought about how to make my card. In the end I settled upon one of my favorite stamp sets from Taylored Expressions - Discover Your Wings. At first I was going to use this wonderfully large floral image from the set, but then I took a look at one of the gorgeous butterfly images from the set and decided to use that one instead. I used two Memento inks for the card. New Sprout to stamp the butterfly and Bamboo Leaves for the sentiment. Finished the card off with a few green rhinestones. Thanks for taking a peek..... and thank you to all the super sweet ladies who play along with Less is More each week and leave the most lovely comments!! These ladies are the BEST!! So I tried my hand at creating a card using some recycled items... thus the title of my post. 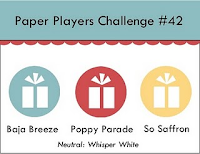 The challenge this week at The Paper Players challenge blog is to use recycled items (envelopes, flyers, etc.) on your card. To be honest I don't often look at the stuff I recycle as something I could use on my card. But I decided to give it a go for those lovely gals over at The Paper Players. My card follows a sketch I got from the Hero Arts blog (sorry that I don't have the graphic) and uses a recycled envelope I got in a package from Gymboree and part of a mailer (the plaid strip) I received from our local utility company on... yep... recycling, tee hee!! The card is pretty clean and simple... just how I like it. I hauled out my Cricut and used it to cut all the shapes used on the card, except the orange star in the center of the big star. That one is a stamp from the Hero Arts set Galaxy of Stars. I stamped it on the envelope and then trimmed out. Thanks for taking a peek... if you have never played with The Paper Players you should!! 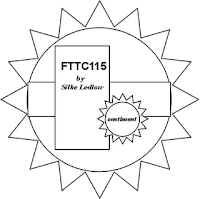 And now I need to say a big "Thank You" to The Paper Players for you see last week they picked my entry in their previous challenge as the "Headliner"!! Short post today with a card for ODBDSLC55 to use a bird on your card. I don't have any of the ODBD set that have birds in them, but I do have this lovely designer paper from Stampin Up! called Botanical Gazette that has this sweet little bird image on it. I trimmed the paper so that the bird was sort of a focal point and distressed the sides. I stamped the verse from the ODBD Daffodil Tag set on white cardstock and diecut it using the ODBD Elegant Ovals dies. A Spellbinders rectange die was used to diecut some more designer paper and that was layered with verse and a second elegant oval using foam dimensionals. A blue Zva Creative crystal flourish and a bow tied with some May Arts silk ribbon finished the card. A One Layer Wednesday Card... on Wednesday!! I used PTI's With Sympathy set. This is such a beautiful set. The images are so very serene and I love every sentiment in the set. Now we weren't supposed to use flowers, but the image I used doesn't say "flowers" to me, but "wheat grass". Whatever the case I just love it and the sentiment I chose. I used PTI's Soft Stone for the card base and SU! Baja Breeze and Blue Bayou inks. Thanks for taking a peek.. 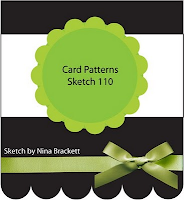 The new sketch challenge over at the Waltzingmouse sketch blog is to make a set of small cards. When I saw the challenge I knew it was the perfect for the current Moxie Fab World Tuesday Trigger: Farm Fresh. I drew my inspiration mainly from the color combo (to my eye orange and bright blue) and somewhat from the pattern that runs along one side of the towel. I guess that is what inspiration is all about... seeing where it takes you. But doesn't that towel just make you think of the freshness a spring day or a jar of flowers?? I used a medium sized flower from the Heartfelt Creations Flora Grande 2 set and two sentiments from the WMS set Frame It to make my set of "thank you" notes. I had thought I would go with some buttons on the cards, as well, but they just didn't fit. So I went with a few rhinestones instead. I took a bit of liberty with the sketch, but, again, I suppose that is what inspiration is all about... seeing where it takes you. Thanks for taking a peek... hope you find some inspiration today! Hi, again! 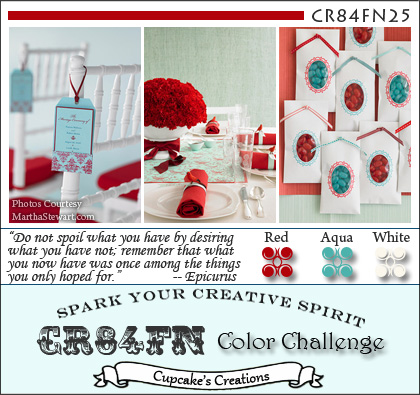 Second post today with a card for the new Etsy Inspired challenge, as well as Color Throwdown. I haven't done a Color Throwdown challenge in a long time, but when I saw the colors I had just had to take it on. I just loved the boldness of the red, yellow, black and cream combo... 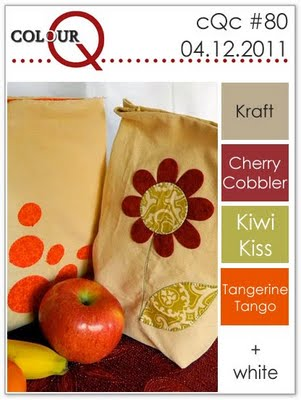 The inspiration piece I chose from the Etsy inspiration store EX Baggage Co. is the perfect fit for the Color Throwdown colors. Stamps used are from the Taylored Expression Discover Your Wings set. Papers are from the October Afternoon Thrift Shop line. The layout is based on a sketch from Taylored Expressions (TESC135). I think this card must be the fourth one I have done this week that involves a color challenge! Not entirely sure why, but I'm lovin' color challenges right now. Whatever the reason I'm sure having a lot of fun and my mojo seems to be running in high gear! Thanks for taking a peek... go get your color on! Hello!! 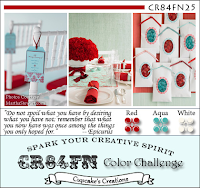 A quick post with a little card for the new Less is More challenge: A Touch of Red. When I saw the challenge I initially thought I would combine it with One Layer Wednesday, but after trying to create a one layer card based on Jennifer's sketch I wasn't happy so I scrapped that idea and went with what you see here. The card is a 4.25" x 4.25" square. Stamps are from the Waltzingmouse set "Frame It". Ink and cardstock are from PTI.